Sweets & Dry Fruits: The Diwali celebrations must begin through the great treat to the taste buds. Thus, one of the most mouthwatering Diwali gift ideas, adds a delicious and crunchy taste of the Mewa Barfi that is the Indian sweet blended with super-boiled milk and sugar with spices; and the crunchy dry fruits such as almonds and cashews decorated in a beautiful tray. This tray would make a kick start to the celebrations when it reaches the desired place at the right time. 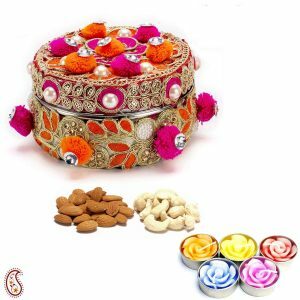 Designer Dry Fruits Diwali Gift Pack With Diyas: The Gifts for Diwali can be truly attractive when we would be quite choosy regarding the selection of traditional delights for the festive occasion. The magnificently decorated tray filled with the delicious and crunchy dry fruits such as almonds, cashews, kishmish, and pista; is accompanied by the beautiful floral design wax Diyas that can be used to decorate the homes during the dawn and at the evening. Hand Carved Oval Stone Box With dry Fruits & Diwali Diyas: The marvelously handcrafted stone box in oval shape, carved with the figurines of elephants that reflect prosperity, along with the pouches filled with dry fruits and the Diwali diyas that add glamor to decorations, would be the fabulous gift items included in this splendid Diwali gift combination. This gift idea brings the warm wishes for prosperity in the traditional manner for the loved ones. Cadbury Rich Dry Fruit Diwali Hamper: The terrific combination of the rich taste of chocolates blended with the crunch of dry fruits, packed in the eye-catching box; added to the spectacular Diwali greeting sending the warm Diwali wishes in terms of the colorful Diwali Diyas and the meaningful Diwali wish, can be a fabulous Diwali gift hamper that combines the riches of chocolates and dry fruits through the renowned confectionery brand. Ganesha With Dry Fruits Combo: The eye alluring idol of Lord Ganesha who is the God of knowledge and arts, along with the polka dotted traditional pouches filled with delicious dry fruits such s almonds and cashews would be a creative combination of religious and traditional Diwali gift idea that would be appreciated by the loved ones for the rich taste and the wishes for showers of blessings. At Giftcart.com, the interested buyers can get beautiful combo gifts of dry fruits, specially designed for the festive occasion of Diwali. Similarly, Giftcart.com offers a fabulous range of appealing gift ideas for various other special occasions. The online gift store can be the one stop shop for more creative gift ideas.